Okay, it doesn't look like the Al thread is coming back :sniff sniff: so I thought I'd create a placeholder for it. 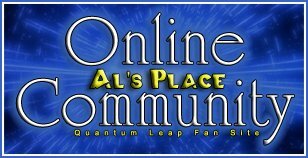 What about Al (either as seen in the episodes in action during a Leap or aspects of his backstory as revealed during a Leap) do you find the most poignant? I'll post later with my response. I'm always just so impressed with Al's commitment to Sam through everything......going from MIA to The Leap Home must have been hard for Al to keep a friendship going, when Sam was acting selfish and childish....then to do the complete 180 in Leap Home: Vietnam.....I think the combination of those three episodes define Al's character for me. Yeah I agree the events of the Leap Home happening immediately after MIA would have been most hurtful to Al. I also think that when Sam leapt into Al to save Lisa, Al wasting so much time talking to himself led to Sam not saving Lisa also would have hurt him a lot. My thoughts....I guess I'd have to choose the final moments in M.I.A.--when we realize this supposedly cavalier womanizing loose cannon of a man actually endured so much and to this day loved Beth with every fibre of his being. I definitely agree on that one! During the dance, I am in a continuous feeling of cringing/crying because I can see the immense emotional pain there. In LH part 1 in the cornfield ("I think it's damn fair") is also a sad but memorable moment. I love that line, because it's a jolt to Sam, but it's something that Al needed to say, and probably wanted to say earlier in the leap when Sam started acting childish. If you like that part of that episode, then you might like The Impossible Dream. It's an audio that we have here... at Al's Place. Check it out. I don't know why..... ...... but this article just made me think of Al. Let's open the floor for discussion. I'll stay fairly superficial this time since I required such deep delving on the last question. Outfits....which of Al's outfits (BESIDES the dress whites) is your favorite? To answer both questions. Al's character really apealed to me through everything he did. His faithfulness to Sam, when really he should have kicked Sam's but for being an idiot. (some genius. LOL) Also his passion. He's been through so much himself, he's endured so much hardship growing older that it gave him back bone and made him really passionate. He was able to teach Sam a lot. Sam really seemed ignorant to a lot of things that Al had lived through. We all know that in real life things aren't black and white as much we would like for it to be that simple. But Al lived through a whole grey area and was able to pass on his wisdom and experiences to Sam. "Don't go away nuts, just, go away"
Al looks good in any thing he wears! I don't know that there is any thing that Al could wear and not look good in . But if I have to pick I'd say his outfit he wear in Disco Inferno I just loved it! About the other Question: I feel that Al's way of dealing with Sam is Al's way of showing just how much Sam means to Al. Today I watched Honeymoon Express. Al stood up for Sam and project QL. He was willing to go to bat for him. Seems to me that Al thinks of him as a Son and it shows though out the Seasons. Sam and Al have to put up with each other, because as I seen to day Al is all Sam has. I don't even want to try and know what that must feel like. But I think Al does and that is way he is faithful to Sam. Hey I love the both of them! As for what I like best about Al, I always loved the loyalty Al had to Sam. He always, always, placed Sam's welfare over his own. For instance, allowing Sam to save his brother Rather that being Saved from his POW days early. Just think, If Sam had saved the POW's, Al would have been repatriated five years earlier. Five years earlier, Maybe Beth would've still been waiting. After all, I don't think it was ever stated when Beth had Al declared dead and remarried. Then there was Kill'in Time. Al went after a known killer, knowing that Leon Stiles had a gun. He went after him to ensure that he would be taken alive so that Sam wouldn't be killed in the past. For me, I think it would have to be Ruthie. He seems to think back on her with the most fondness of the four exes (for obvious reasons I'm excluding Beth, whom we know he never ever got over), and provides the most extensive details about her. But maybe your favorite ex-wife is a different one.....who would you like to see Al meet up with again and why? As you well know, Jennie Ruthie is my favorite of Al's other ex-wives, and I have engineered a reunion for them, which began in "High Hopes" the second of my 5 pre MI stories, and is now at the face-face stage in story 4 - "Snake in the Grass". These stories - shameless plugosity - can be found at www.fanfiction.net. "Snake" will be posted as soon as it is finished. Okay, Im going to answer both questions so here you go.. Thoughts on Al: I think under all thoughs perverted thoughts and sexual yernings Albert Calavicci is a mature and loving man. But it tears at my heart to even imagine what it would be like to go through the heartaches he has, and to feel his ever growing need to pay back sam after the 5 seasons of QL and the 1st (virtual) season on this website, he owes Sam Beth, Trudy, and his youngest daughter Christa. Al's Outfits: Wow! What a thought! I think it glows with personality and pure unfashionability to dress! But being in love with Al (which I am indeed) I think it is the cutest thing in the world! *Especialy his adorable "Fadoras" (or as I call them "Pimp Hats")! I just have to say I love Al and I love Sam. I can't wait for the next season. Al looks soooooo Good in his white Navy out fit! Oh man I just love it! Did Sam save Trudy in a Virtual Episode? Which was the ex-wife who turned Al into a vegeterian because she would cut up his steak at restaurants? I always found Al's connection with retarded people (because of Trudy) heart-wrenching. "We're NOT gonna lose Jimmy!" Does anyone think there were leaps in between MIA and the Leap Home? Just as there were in between The Leap Back (where Al talks about Sam needing to fix up the leapee with a waitress to raise "his" daughter) and PlayBall? Yeah, Trudy gets saved in I'll be Home For Christmas Parts 1 and 2. As you well know, Jennie Ruthie is my favorite of Al's other ex-wives. I didn't know that Al's gave descriptions of all his ex-wifes. I always woundered if the gal that he talk to on the side of the road might have been his 2nd or 3rd wife? (before they were married) I guess I need to go and listen a bit closer. In Genesis? It says in the credits that it was Tina, but I (and others) think that it was just a one-night stand with a girl of the same name. Since Tina and Al met for the first time in a casino in Vegas. Then again, they could just have been doing "pick up a stranger" foreplay, who knows? Let's see... What do I like best about Al? Well, even when I was nine years old and his dirty comments went over my head, he still made me laugh, so his humor's a big part. But it's his loyalty and friendship to Sam that gets to me. Al doesn't seem like an easy person to win over - he's lost so many people close to him that he probably keeps most people at a distance out of fear of being hurt from losing another. And yet, somehow, Sam won him over, believing in him when he no longer even believed in himself, and their friendship fascinates me. Favorite outfit? The uniform. What can I say; the man looks good in a uniform. And the black leather jacket in Killin' Time. As for the wife I'd like to know most about, that'd be Maxine. His comments in A Hunting We Will Go made me curious about this woman. And I feel bad for her, for being accused of cheating when she didn't. I'm going to plug Jennie's story "Stardust" on the Prequels page of the VS. A lot of her story is how Sam breaks down Al's emotional walls, and its soooo fantasically good. Go check it out. I'd have to second (or is it "fifth" by now?) the mention of Al's dress whites. I am a sucker for a uniform. Thanks, I'll have to check that out! It can go on my long list of QL things I need to read (right up there with practically all of the Virtual Seasons.) I've always been curious about their relationship; they don't seem like they'd be compatable, and yet, they get along so well. you know, not that this is important, but i am watching Double Identity now and i am noticing that this may be the solitary only episode in which Al wears shorts. i just kinda found that interesting.